Our executive chef and team will choose a winning pizza to be featured on the Sauce chalkboard beginning November 1st. *Winner will be chosen by our Culinary Team based on taste, flavor, cost and creativity. Entries must be received online or in-store by midnight PDT October 16th. 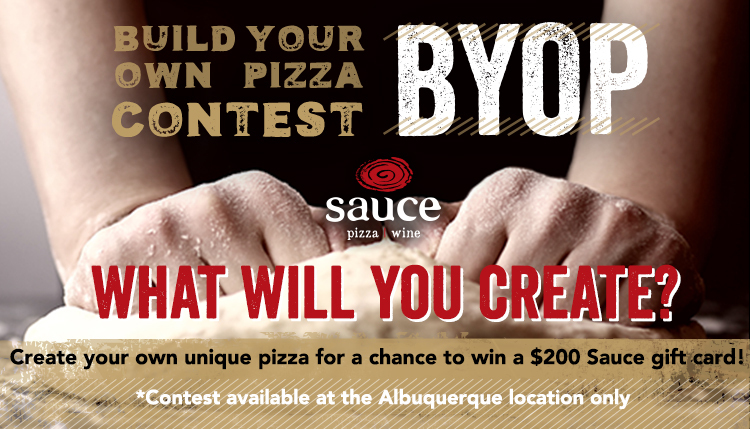 Contest available at the Albuquerque location only. The winner will be notified via email or Facebook message. Employees of Sauce Pizza and Wine are not eligible. For a complete list of contest rules and eligibility, click here.